You have missed three things – please read the DP specification, with it and access to the controller PCB you would be able to identify which signal is actually the AUX+ and which is AUX-. The HPD can be also identified by knowing its properties. The third thing what you are missing is an essential information about the LED backlight unit. Knowing that, you would no more wonder about that no connect pin. BTW we got a totally broken unit and the control PCB has a type of LSN154YL01-005 … probably the Samsung model? You have cost me a display panel, sir… I was unable to trace any further with the EM shields in place so I had to desolder them and crushed a small inductor in the process. Well, oh well… now I can see things a bit better and can plan for the next unit. With the shields removed, I am able to probe the components immediately adjacent to the DP635, which as it turns out is the only IC under that section of shield (contrary to original thought). Here there is the only array of ten adjacent capacitors on the board, which seems very likely to be for the four DP lanes plus the AUX channel. Truthfully I’d forgotten that AUX is capacitively coupled. Actually, to be fair that requirement was added in DP 1.1a, which I am not completely familiar with. But this panel appears to drive the differential AUX signal straight into the DP635, and does not seem to make any distinction between ‘+’ and ‘-’. So unless I am missing something very elementary, and mind you I have not yet powered up the panel at all, I still don’t think it’s possible to identify the particulars of the AUX or DP lanes. I will wait to apply power until I have the demo board in hand to avoid soldering flyouts everywhere and risking damage to the already in jeopardy PCB. Presumably in the same manner there is likely to be a resistor nearby connected to HPD so it can be pulled up by the DP635. I haven’t looked for that yet. 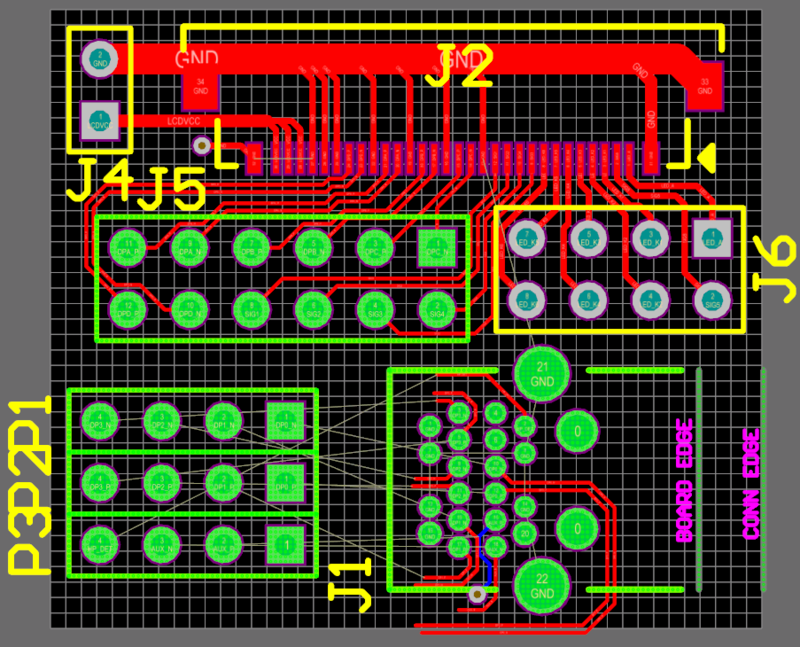 I will probably wait to figure out the specifics until I get the test breakout boards. Probing two sides of a board on very small components is no fun. Plus I can’t do anything at this point anyway. I’m not sure what you’re getting at with the backlight. 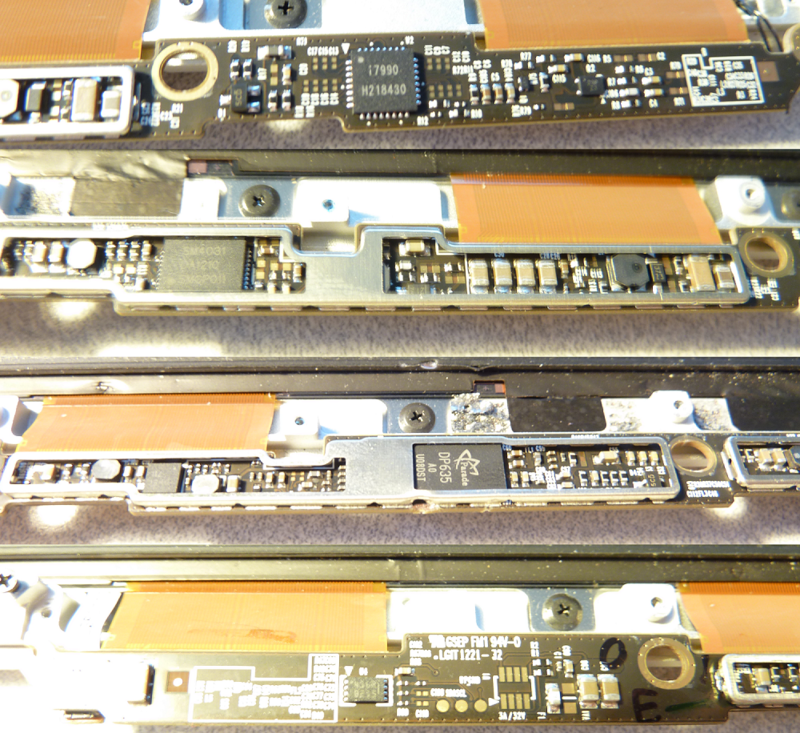 I’ve scrutinized the iFixit teardown photos, and… It’s just LEDs. Looks like nothing else there. I’m not familiar with the Macbook Retina’s featureset, is there supposed to be something ‘groudbreaking’ with the backlight that I’m not aware of? Indeed LSN154YL01 is the Samsung version of the 15″ Retina. The panel which we had was so broke, that the two LC glasses got separated when we tore it down. So we cut off the driving board. On mine, there are not only the capacitors, but also two resistors around the aux caps. One is pulling low, one is pulling high. In the DP specs, you might notice a image, where the capacitive coupling and the pull resistors are shown, so that gives you a clue about the polarity. I have tried to power the cut-off board with 3.3V (not sure if that is correct.. but I have nothing to loose) and it makes a little consumption on that… and the HPD signal gets asserted. So that can be also confirmed, plus there is a pulldown resistor on the HPD line, as per DP specs. About the diodes – if you manage to see them close enough, you will maybe get it. Or should I tell you ? So far you fall in “my competition” category and I am not sure what are you up to. Well, you can see my modus operandi from the rest of the site here – I’m open-sourcing and publicly releasing anything I come up with. So in that regard I am not “commercial” competition per se. But if you want the details kept under wraps I can’t promise that, it conflicts with my goals here. I’m a professional electrical engineer, reverse-engineering stuff is a fun hobby. My panel is basically intact and per iFixit they can’t be removed without damage, so I can’t see the diodes in person, and the iFixit photos just aren’t framed right nor high resolution enough. The only thing that seems questionable is the small black bit at the base of the connector tail, where it meets the LEDs, but I can’t see it close enough to tell if it’s anything of interest. Forgive my ignorance here however I don’t totally understand if you are supplying boards or simply giving instructions on how to make them. I would love to make an eyefinity group using these however I know my soldering and electrical skills would not be up to the task. Another question I have is regarding the overclocking potential of these PCB’s and panels. Of course the sheer resolution of three of these would be well worth it however overclocking them, even to 75hz would be the icing on the cake. It’s a bit of both. These posts are mostly the path to arriving at the finished product, a log of my findings as I investigate the task, and I release my design files so that others can learn from and adapt the concept or just have the boards made directly. Alternately, in the case of the Simple iPad Interface and hopefully many others in the future, I can offer to order the boards and components and assemble the boards myself for a nominal fee. I have no issue providing prebuilt versions of any project I mention here, so if you are interested in something in particular please feel free to ask. 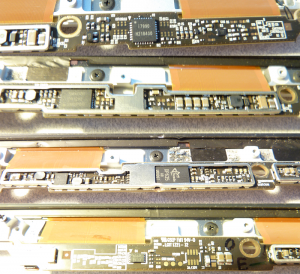 At the moment however, the Macbook boards are purely conceptual. As a previously unreleased bit of news, I did finally get my Macbook panels running yesterday, but I don’t have a board drawn up yet to offer as a working product. I really hope to have something done in the next couple of days and a prototype ready to assemble in two weeks, but that’s not by any means a promise – still plenty of things to work out! Regarding overclocking, I can certainly look into it, but I will need a couple of days to do so, but if I figure out anything interesting I will post it here. Im sure you already know about CRU (Custom Resolution Utility). That is the software I use to overclock my korean 1440 panel. Also depending on the bandwidth you may have to patch the 330mhz cap using ToastyX’s pixel clock patcher which unfortunately requires you run Test Mode in windows. I am sure this is info you already knew however just in case I wanted to point you to those two things. I love your work on these and look forward to hearing your progress. P.S. how much bezel is there and how thick is the panel? I would love to make a surround for the 3 monitors in a portrait eyefinity group as soon as the MST hubs become available. I actually wasn’t aware of the stuff on the software side, so thanks! I’m a hardware hacker, so I’m not always keen on the current state of the art on the software side. [Edit] Oh. And the iPad panel is typically 2.5mm thick, 4.5mm at the top edge (where the controller is); I don’t have calipers or a micrometer wide enough to measure the domed back of the Macbook top assembly, but iFixit says it is 7mm at its thickest point, and it is 2mm at the edge. Presumably the glass is 2-3mm thick across the whole panel, although again I can’t verify that. Those bezels may be a deal breaker on those panels however I am still really interested in the LightBoost Alienware panel. It seems to have more reasonable bezels and it may be possible to get all of the features working on that one. And thank you for helping the PC community. I’ll probably kick off the posts on the Alienware panel this weekend, assuming I don’t get distracted (I’m hopefully taking receipt of a new milling machine this week). I look forward to your posts on the Alienware panel as I think it is more geared toward FPS gaming then the Apple products, assuming they can be driven at 120htz with lightboost. Do you think display port may be an option on the PCB? With the new MST hubs coming out I think that may be the best option to drive three of these. Again thanks for the replies, I will continue to watch as it unfolds. P.S. On a side not I have gotten in contact with a local Car Audio Guy who assures me that he can create a housing for Portrait x 3 with a Vesa mount. If while you are messing around with these panels you could take some measurements of the panel and bezel I would greatly appreciate it. Measurements of the panel – I can do you one better: http://www.displayalliance.com/storage/1-spec-sheets/LP173WF2-TPB1.pdf … pages 18 thru 20 include very usable mechanical drawings. I’ve taken these drawings and have drawn up a 3D model of the panel, but it’s missing a few important features (e.g. screw holes) that I’ll need to add before it’s truly useful. If you would rather work with a 3D model than 2D drawings I can include it in the post. That a awesome project !!! im trying to do something similar to this but with touch screen lcd. 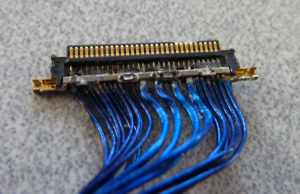 i pretty much need to create hdmi-lvds converter similar to this: http://www.chalk-elec.com/?page_id=1280#!/~/product/category=3094861&id=14647633 but pcd designing is not my forte do u think u could help ? For what it’s worth, I’d be willing to bet a fair sum that the chalk-elec board is a by-the-books implementation of this TI application note: http://www.ti.com/lit/an/slla325a/slla325a.pdf. 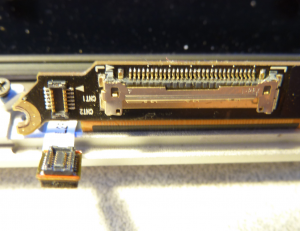 TFP401, SN75LVDS83B, a couple of connectors and a PIC as an I2C slave, not too complex. Don’t get me wrong, I’m not trying to brush you off… unfortunately I’m up to my ears in contract work and continuations of the projects already posted here, which really need to take precedence. Maybe when that has all died down (and assuming I don’t foolishly agree to anything else in the meantime) I can work out some hardware for LVDS… until then, I’m afraid I can’t help, sorry! awsome !! no worries, im in no rush i also sent you a email a few days ago when i posted a comment here with contain more info if you are interested later on. Do you know how much time (weeks or months) approximated you be need to finish your other projects/contract work ? Ha! 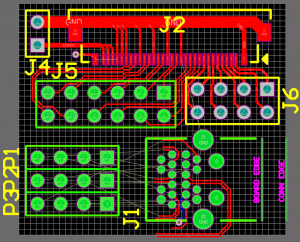 I dare not venture a guess when I’ll be done… in order to truly complete everything I’ve got a few generations of boards to design, order and program, at a few weeks per cycle… could be well into the middle of the year before I’m hammering out the firmware for some of it. Hi, this is probably a VERY basic question after reading this site but I have searched all over the net and you seem the most knowledgeable. I have a early 2013 15″ MBP. The screen cracked when it got dropped and have been using it for almost a year with the cracked lcd. 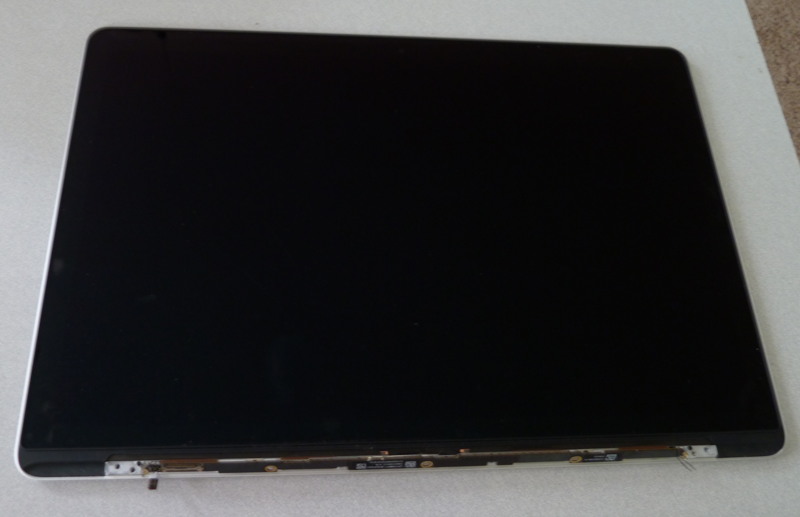 I finally got around to replacing the lcd panel and noticed there was no backlight. I assumed the cheap ebay lcd off ebay was faulty so bought a cover assembly. It was used but working. I still have no backlight. Do you have any insight on what could be wrong? I really appreciate any help you could give me. My email is green1181 at hotmail.com. thanks!! Hmm. Did your original (cracked) panel have a working backlight? Does it still work? That’ll tell you at least that you haven’t fried your motherboard’s backlight driver. If you purchased a “bare” LCD for this model (black glass on both sides, no rear metal shield or diffuser or anything), it wouldn’t have had a backlight. 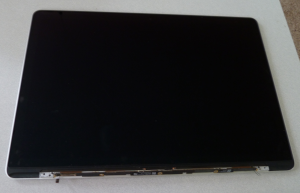 In order to keep the Macbook skinny, the backlight is embedded in the lid assembly instead of in the LCD panel itself. Now, as to why a complete lid assembly wouldn’t work, that’s a new one. The backlight is just a bunch of series-parallel strings of LEDs, there are no smarts in there, not much to “blow”. If your motherboard’s LED driver works, first verify that the LED strips are plugged in, there’s a little bitty connector on the left side of the PCB at the bottom of the LCD (possibly under some plastic covers; see the other posts in this series for photos) with a white flat flex cable coming out of it. 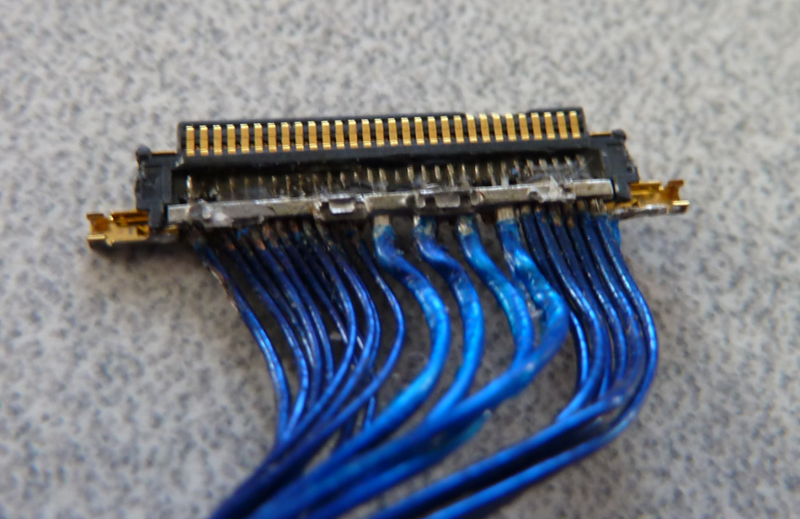 This flex cable goes to the LED strip. It should be simple to test the voltage on this connector to determine where the problem is likely to be – if you assume that the silkscreen arrow is pin 1, and the pins are numbered 1-6 down the right side and 7-12 down the left, then the voltage between pins (5 and 6) and (any one pin on the left side) should be about 50V during normal operation, full brightness. If this is what it measures, then there may be a problem with the LED strip; otherwise, your motherboard or the connecting cable aren’t bringing the voltage to them properly. Hopefully this helps. Let me know how it goes.